Elite divers hauled four more young footballers out of a flooded Thai cave on Monday, authorities said, bringing to eight the number saved in a stunning rescue mission but still leaving five others trapped. 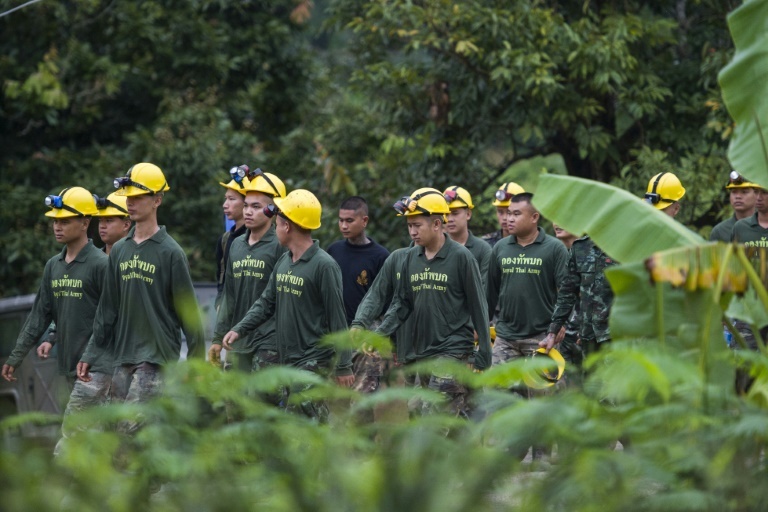 "Hooyah," the Thai Navy SEALs, who have played a crucial role in the against-the-odds operation, said in a Facebook post as they announced that a total of eight members of the "Wild Boars" football team had been rescued on Sunday and Monday. The extraction of the four on Monday followed a similar pattern to the previous day, with the youngsters emerging in quick succession just before nightfall after navigating a treacherous escape route of more than four kilometres (2.5 miles) that included extremely narrow and flooded tunnels. The saga has dominated global headlines, with the team spending nine days unaccounted for inside the cave, before British divers found them -- emaciated and dishevelled -- huddling on a muddy bank above the flooding. "Everyone should be proud. (But) the mission is not over yet," Prayut said.